There are so many reasons why spring is an ideal time to boost the curb appeal of your home, from bright bursts of colorful flowers to warm, sunny weather outside. What better time of year to put your home on the market with beautiful curb appeal? If spring is your season for selling, consider the many ways in which you can boost the curb appeal of your home in the upcoming weeks. By investing in quality lawn care for your home exterior, you can create a polished look for your yard in any season. 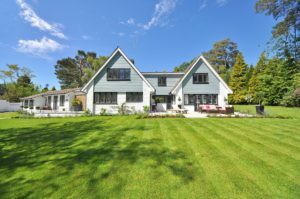 For spring selling, in particular, a green, well manicured front lawn can look especially appealing for a potential buyer seeing your home for the first time. A potential buyer will make a first impression of your home almost instantly, so why not start with a fun, brightly colored door to open? With a clean, eye-catching entrance to your home, your home exterior is sure to capture the attention of anyone looking at your home for the first time. Does your siding need to be power washed or scrubbed? Let the warm weather of spring be your perfect excuse for getting outside! By cleaning up your home exterior, your home can look its best for walk-throughs, open houses, and photos that will be posted online. New lights and hardware are the perfect complements to a beautiful home exterior. Complete the look of a freshly mulched garden or brightly painted front door with brand new lights and hardware for a polished entrance to your home. The hardscape that a potential homebuyer will use to walk toward your front door is just as crucial as the door itself! As you invest in great lawn care for your home, be sure to polish the look of your pathways by edging them and sweeping them so that they are free of dust and lose stones during showings. This entry was posted on Friday, March 29th, 2019	at 10:18 am	and is filed under Residential Sales	. You can follow any responses to this entry through the RSS 2.0	feed. Both comments and pings are currently closed.